Grab your coffee cups, we are heading to the dock again. The gray skies of November will soon give way to December. Hope you survived Black Friday. If you did you are better off than all those millions of turkeys who sacrificed themselves so you could have a nice Thanksgiving Day feast. Hope you enjoyed it with someone you love. My daily journey down the dock is a long one it seems. I am usually alone in my thoughts. In solitude, I travel the short distance from the back porch to the neighbors dock. Although the path is short, my mind travels a much longer one. It goes from Solitude, to Solace and finally, Serenity. Solitude is defined as a state of seclusion or isolation or lack of contact with people. That suits me fine. That is why I go there. However, I am usually not alone for long. Within seconds, the company of creation surrounds me. 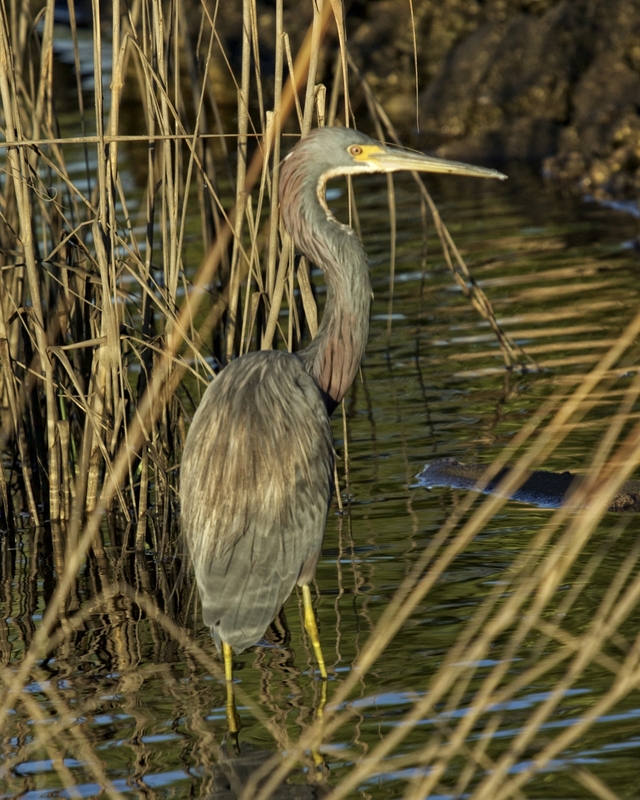 Lately it has been my new "lil buddy", the Tricolored Heron. This morning the heron is sitting in solitude on the floating dock, patiently waiting the dawn. Its eyes fill with the golden light of morning. I find solace in the company of the birds presence. Solace means to find comfort in time of trouble. You can’t listen to the news without knowing we are in a heap of trouble in this world today. As I sip my coffee and focus my camera on the bird before me, I do so with gladness. I capture the solace of the moment with each click of the doohickey. As I give thanks for the day and all its blessings, I find myself moving on down the long path from Solace to Serenity. You can’t watch the grace and beauty of a bird in flight without being filled with awe and wonder of creation. How did our Maker design such beauty? The structure of the feathers, the length of the wings, and the type of feet or claws are all unique to each bird and yet they all take me on the same journey each time I watch them. The journey from Solace to Serenity, where there is a place of calm, a place of peaceful and untroubled waters. A full Thanksgiving moon was indicative of all the full tummies that day! Solitude..a state of seclusion or being alone like this lone "Sentinal of the Dawn". Time to begin our journey today..
As I capture birds in flight I take the journey from Solitude to Solace with each click of the doohickey..
Each bird is unique in its flight..
Each feather, each bone, each muscle and tendon have a purpose..
Each feather on these wings has a purpose...just like each hair on your head..(exceptions made for my bald friends..sorry). I raise my hands in praise just like the wings of this bird raised to land. We have made it to Serenity now...Time to start a new day..
How bout breakfast with that coffee now!